1 1/2x 2 3/4", this Arkansas rock crystal self-displays on a slanted base of beginning regrowth. It's got a broad main channel face with pale tan rectorite [mountain leather] in a former contact. Other areas of interrupted growth show regrowth and a large colorful iris inside. 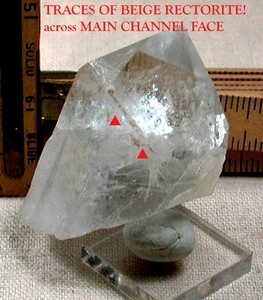 Devic veils and foils show at its' clear termination; dot inclusions of blue shale clearly show against denser, bottom veiling.